By Robert Romano — Somehow, despite sequestration, the sun rose today, and it will set. Schools opened as scheduled. The children were still picked up and dropped off by their buses. The roads we travel on did not disintegrate. Seniors’ Social Security and Medicare benefits continued to be put out without any interruption. So did food stamps, unemployment, and Medicaid. Remarkable when one considers that on March 1, the government cut a part of the $3.538 trillion budget by a mere $54 billion, or by 1.5 percent. To hear Obama tell it, March 1 was judgment day. The seas should have boiled. The skies should have fallen. They didn’t. The American people should seriously examine this day and every day going forward these modest cuts are allowed to remain in effect and ask what impact, if any, they had on their lives. Most would be forced to admit that it had absolutely zero effect on their day-to-day existence. 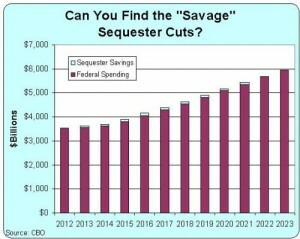 But I’ll leave it to pollsters and charlatan politicians to find any statistically significant population, if one even exists, that even cared that spending was cut — besides government workers, that is. Raising the more salient question: Why not cut more? With a $16 trillion debt, going on $17 trillion, baby, it’s time to think. How are we ever going to repay all of this? The debt has risen every year since 1957. We cannot even meet our current obligations honestly, with the Federal Reserve set to print an addition $500 billion a year to monetize the debt going forward, adding to its $1.7 trillion pile of useless paper. The fact is, we could live within our means and pay down the debt, and the world would not end. We would prosper. 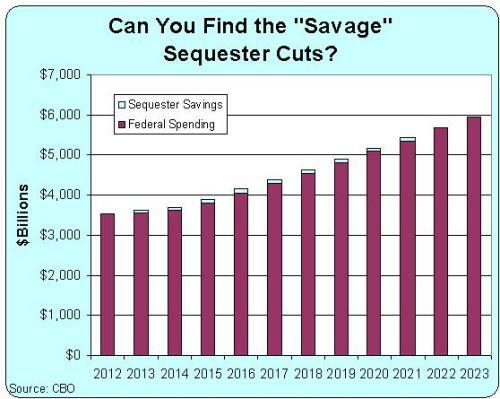 Perhaps what scares government the most are not the spending cuts. But that nobody will notice they even happened.